Toruń museums and their collections are mainly concerned with the history of the city. They superbly document and illustrate the city’s art history and artwork through numerous highly valuable exhibits. The Old City Town Hall and Nicolaus Copernicus House are the best-known and most popular museums in Toruń. The former, beside its > exquisite interiors, houses several permanent collections featuring mostly Toruń artistic output of the pre-annexation period up to 1793 which was once on a high artistic level. < The latter, apart from illustrating the life and work of the great astronomer, constitutes the best example of the so-called medieval Toruń burgher tenement with its interior and architectural style, typical of the old Hanseatic emporium. Another museum concerned > only with the history of Toruń is the History Museum in the Eskens Palace, illustrating the city life under Prussian rule. It is with these museums, in particular the Sound and Light Show of medieval Toruń in Copernicus House, that one should start exploring the history and art of great old Toruń. Visiting all the museum might take up several days. Most museums are open from 10 am till 4 pm out of the tourist season. The opening hours may change in the season and some of them may stay open even until 7 p.m. on some days of the week. There is no admission to most museums on Mondays. Please check the opening times before your visit. The monumental Old City Town Hall, which houses the District Museum, is one of the biggest and most magnificent buildings of its kind in Europe. 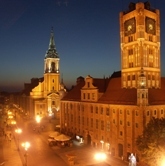 It is a monument to Toruń’s glory as the former trade empire of Hansa. The District Museum in Toruń apart from the interiors, displays Gothic art collections (sculpture, painting, the unique collection of magnificent stained glass, etc. ), Toruń’s handicraft (including gingerbread baking tins, intarsia), coins minted in Toruń and painting (including a big-sized painting depicting the moment of concluding the Second Peace of Toruń). In the Royal Hall, which had seen the visits of nearly all Polish monarchs since 1454 and the death of one of them – John I Albert, one can find the oldest pictorial guide to the Kings of Poland, and in the Burgher Hall, an excellent portrait gallery of Toruń patriciate of the sixteenth and nineteenth centuries. • Gallery of Polish Painting from mid. 18th c. to mid. 19th c. (among others: Matejko, Kossak, Chełmoński, Wyspiański, Witkiewicz, Grottger). The Nicolaus Copernicus Museum is the biographical museum of the most eminent Toruń's citizen. It is located in two beautiful Gothic houses: in his family house (No. 17; exhibition devoted only to Copernicus) and adjoined neighbouring patrician house (No. 15; show of the interiors of a typical medieval merchant house). Obviously it is the most popular with tourists museum in Toruń. The excellent supplement is the model of 15th century Torun with sound-and-light programme. Entrance to the museum - in the house No. 15. • 'The Rapperville Exhibition' - this exhibition, the only of this kind, is actually the reconstruction of the oldest collection of Copernicus memorabilia on display organized in The National Polish Museum in Rappersville, Switzerland, in 1870. 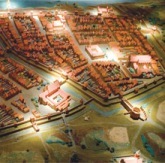 • The model of medieval Toruń - the 18 minutes long performance: the light and sound presentation on Toruń's history, architecture and Copernicus at the model of Toruń from around 1500. • 'Nicolaus Copernicus. Life and Work' - the exhibition presents the world, home, and family background, the school years, and finally the years of creative solitude in Frombork (it was occasionally disturbed by the necessity of performing important functions and giving public lectures) of the great astronomer - and at the same time a humble canon of the Warmia cathedral Chapter. • 'Study room of a scholar' - a fragment of the museum exhibition, has two aims: on the one hand it refers to the archetype of a scholar - the pursuer of truth, which is present not only in the culture of Europe, on the other it complements the display in the interiors of the burgher's tenement house. • 'The World of Toruń Gingerbread' - in the beautiful interior of the 15th century merchant house, typical for wealthy medieval Torun patriciate, one can visit the exhibition showing the everyday life of Torun citizens on the turn of the 15th and 16th centuries. The stairs in the biggest room, the tall entrance-hall, lead you to the gothic cellars, where you can start visiting the exhibition presenting the history of gingerbread craft, which had its origins in the 14th century and flourished in the 17th and 18th centuries. • 'The World of Orient' - monuments of Chinese, Japanese, Indian, Korean, Vietnamese art and art handicraft. The oldest ones are the Chinese and come from the times of Han dynasty (206 BC - 220) with which the first china artefacts are connected. • 'Discovering the Past' - archaeological exposition with 9 parts in which the history of colonization (from the year 10,000 BC to mid 13th century) of the lands of present Kuiavia-Pomerania Region is shown. Not only the numerous and precious archaeological artefacts are here but the exposition contains many models of the way of living in a different ages as well. • 'Militaria from the Middle Ages to 20th century' (collection of European and Oriental weaponry, the most precious are the specimens of medieval swords, 16th - 17th c. musket and pistols with a circular lock). It was the very first castle of the Teutonic Knights from which the colonization of pagan Prussians and creating Teutonic state started. It was the residence of a Teutonic Commander. It was destroyed in 1454 during the burgher uprising against the Teutonic Knights what in succession caused the 13-years Polish-Teutonic War ended by signing famous Second Toruń Treaty in 1466. It was only 1966 when the ruins was explored and prepared for tourists. 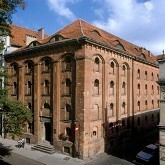 The Travellers` Museum has its place in an old granary at 11 Franciszkańska Street, which was restored and adapted for the needs of museum. On the back of the house there is a pavilion which was built for the purpose of presenting the photos taken by Polish explorers during their exotic journeys. A donation which was made for the citizens of Toruń by Elżbieta Dzikowska after Tony Halik`s death makes the permanent exhibition of the museum. It is the set of objects from various countries and cultures collected by the couple. The collections are devoted to famous Toruń's traveller - Tony Halik and his voyages memorabilia. They were granted to Toruń by Tony's wife - Elżbieta Dzikowska in 1999. The 'Tony Halik. Born for adventure' exposition is situated on two floors of the old granary house. The introduction is the biographical part with his documents, among others: Argentinean passport, identity card, driving and sailing licences, numerous accredit cards (he also was a journalist of NBC), many awards and distinctions. Museum of Ethnography in Toruń is one of the three largest and independent ethnographic museums in Poland. It was established in 1958 as a result of becoming independent the ethnography section of the District Museum after the initiative of the foundress - prof. Znamierowska-Pruefferowa. The items gathered since 1946 include the whole of folk culture (customs, rituals, household appliances and farm architecture) of northern Poland and of whole Poland in the matter of fishery. The Museum also has one of the biggest collection of contemporary folk art and rural crafts. Museum, and in particular the Ethnographic Park (skansen) with the completely decorated and furnished farmsteads and rural cottages (the oldest of which dates back to 1767) located in the heart of the city, is the primary tourist attraction, which moreover attracts tourists with organized occasional folk events. • Maria Znamierowska-Pruefferowa Room - memorabilia of the founder of the museum. Museum was founded in 1974, although the first attempts were undertaken as soon as in 1945 by famous prof. Jan Prueffer. • Zoology (exhibits of animals, collection of animal development's anomalies, exotic fish-culture). Apart from the Etnographical Park (Museum of Ethnography) this is another open-air museum in Toruń (which in fact is the Museum of Ethnography department). It comprises the specimens of rural architecture of the Chełmno Land and other buildings and instruments associated with the lives and work of fishermen, raftsmen and boatmakers. All the objects exist in their natural location (2nd half of 18th century). Open-air museum which is located in the existing enclosure that once belonged to the local fishing-farming family. The main object of the old pens is a wooden cottage dating back to the end of the eighteenth century, protected in situ. This means that it was being maintained in the same place where once it was built. Other buildings: a barn, byre, shed were moved from the area of the Chełmno Land. They are set in places of the same objects that once was found in the yard, but not preserved to our times. Thanks to these efforts, it was managed to replay the character of an enclosure from the end of the nineteenth century. This adds the attractiveness. The Museum of Writing and Printing has been located in a medieval little church founded by the Teutonic Knights at the turn of the 14th century. In the 16th century the church passed into the administration of the Evangelical community. In the 1920s, the church was deprived of its sacral function. In 1930, the church was entered into the register of monuments as a Grade I listed building. After World War II, the church fell into ruin. Only in the 1960s and 1970s, there were attempts to located a communal library in the building of the church. However, the work started at the beginning of the 1980s and it was stopped half in its way. As a result, the monument was seriously vandalized. - History and workshops in the area of literature. The literature department includes the history of paper and parchment development and techniques of writing and illuminating of incunabula as well as the skill of writing with a quill. - History of European and Asian printing. In the printing section, the history and techniques of printing as well as printing equipment are discussed. The certificate of stay at the Museum is also printed there. - History of European and Asian paper industry. The paper section includes the issues in the history of paper industry. The visitors can also produce their own handmade paper there. University Museum along the lines of similar institutions in the world connects elegant functions of the university with those of science, museum and education. 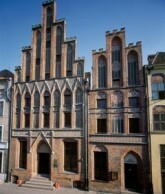 Because of the relatively short history of the Nicolaus Copernicus University in Toruń, it is not confined solely to document the history and achievements of Toruń Alma Matris, but seeks to be an institution promoting culture and art of national and global scale, as well as for the purpose of teaching. - Evidences and mementos of history of science in Vilnius and Toruń. The Battery which was built in 1895 is one of the most interesting objects of the 19th century Fortress Toruń. It is a unique on a European scale - the battery was an experimental model and the only in its sort. Along with the years after World War II the battery (as well as another similar) was becoming more and more neglected and devastated. In order to save the battery a special section of the Toruń Branch of Fortress Friends Society was organized. At the turn of 2008 members of the mentioned section created an independent Toruń Society of Fortifications whose main goal is to save battery and other local facilities. Fort IV named after Stanisław Żółkiewski is one of the largest and most important forts of nineteenth-century Prussian Fortress Toruń. It was built in the years 1878-1884 as the main fort, the third in the series, was the base for the 500-person crew (2 infantry companies) and service department for the number of 14 medium- and 15-22 heavy caliber cannons (total about 800 soldiers and officers), and reached the peak of fortress engineering. In 1894 it received the name Yorck, commemorating the Prussian General Johann David Yorck von Wartenburg. It never participated in combat operations, thus has been preserved in very good condition. In 1920, together with the entire Fortress, was taken over by Polish army in good condition, but without the equipment. In 1926 Fort IV received the present name. From the early 1990s is made available to the public. Perfectly preserved object represents the type of the main artillery fort and is one of 15 such forts in Toruń. It is fully revealed, cleaned of the masking vegetation and best restored. The visit is an opportunity to experience an unforgettable impressions in the maze of stairs and corridors, to acquaint military history, see 55-tonne armored artillery observation posts, revolving observation towers, powerful powder. Museum takes you to a 16th century gingerbread factory. After some short training with the gingerbread master you will recieve a historic gingerbread-making certificate for making gingerbread according to some of the the finest 500 year old recipes. The Museum is an interactive method of getting to know the history of Toruń and gingerbread-making in an exciting and amusing way, for both children and adults. The mission of the Centre of Contemporary Art in Toruń is to develop, propagate and promote contemporary art. The aim is to be a modern and dynamic centre of artistic fervour through establishing a regional art collection, a spectrum of open exhibitions, publishing and educational activities, stimulating support for art and contributing to art market development. The Centre places special emphasis on cultural education through exhibitions, special educational programmes and publications. It is a pioneering role that will involve artistic and aesthetic education, as this region hitherto lacked a large institution focused on exhibiting, developing and promoting contemporary art. The modern building, hi-tech multimedia equipment, innovative web services (virtual gallery at www.ecsw.pl), art community page and art database (ART-BAZA) enable a broad spectrum of creative educational activities that extend far beyond the traditional scholastic approach. Set up in 1990 in Toruń "Pomeranian Archives of Polish Home Army" has grown from the initiatives and activities already undertaken many years earlier by Professor General Elżbieta Zawacka. She was a great person of merit due to her rich history and activity during World War II. She took part in the defense of Polish city of Lvov (now Ukrainian Lviv) in 1939 against Germans, organized communications within the Polish Command of the Silesian Region ZWZ, then communications with the authorities of the Republic of Poland in the West in the Home Army Headquarters. She was courier, in 1943 the emissary-in-Chief of Staff in London, returned to occupied Poland as "cichociemna" (Polish for 'silent-dark ones' or 'silent and unseen' - a secret unit of the Polish Home Army created to maintain contact with occupied Poland during the war). She has taken part in the Warsaw Uprising 1944. After the war, repressed by communists, spent several years in prison. Later obtained a doctoral degree and habilitation doctorate, she worked at the University of Gdańsk, then the Nicolaus Copernicus University in Toruń. The exhibition is located in the historic interior of the tower pressure of Bielany water station. The tower with the old hall after a major refurbishment of pumps has been adapted to perform the functions of exhibition, educational and cultural institutions. The exhibition refers to the history and present day of municipal engeneering of Toruń. It allows to track the evolution of technology since the early days of history of Toruń to the present day. Moreover the proecological character of the exhibitions allows to inform of the risks associated with the current scale of consumption of different types of energy resources and environmental pollution. Museum is run by Toruń's Artillery and Armament Training Centre and by Association of Artillery and Armament. Members of the Association are - first of all - persons who are interested in military history of Toruń and the surroundings, the history of arms, wars and armed conflicts, military architecture and traditions of the military and schools. Toruń has specific conditions for the functioning of the Association. This is the cradle of Polish artillery. Here, for the first time in the history of Polish military school shooting was conducted, during which skills of gunsmiths from all over the country were improved. The first military training and naval school after regaining independence in 1918 were established in Toruń. Here also was the central artillery school station at all levels. Biskupin is a well-known archaeological museum and reservation in Middle Europe. Excavations on Lake Biskupińskie peninsula were initiated in 1934. It was the first prehistoric site in Poland with a vast scale organized research using modern techniques, methodologies and interdisciplinary activity. Wooden remains of the fortified settlement from 8th century BC have been found in an excellent state of preservation, because of wetland, wood protecting conditions. Biskupin has been called Polish Pompeii as well. The archaelogical reservation in Biskupin covers an area of 23 ha. The traces of human habitation discovered here go back to the Late Stone Age, while the most recest come from the Middle Ages. The excavated fortifications, roads and buildings and the excellent state of preservations of the timber material caused a sensation in European archaeology before World War II. The museum was officially opened on 28th December 1983, exactly 750 years after the city has been granted with the location right. It is a regional and historical institution and it mainly gathers and shows items associated with the city and the closest area. The building of the historical town hall, in which the museum is located, is thought to be the most precious and beautiful Renaissaince town hall in northern Poland. The Museum of the Chełmno Land also uses two medieval towers: the Gunpowder Tower (Baszta Prochowa) and the Maiden Tower (Baszta Panieńska). The biggest archaeological section of the museum and a modest ethnographic exposition have been located in the Gunpowder Tower since 1983. The most interesting exhibit is probably a wooden bicycle from the end of the 19th century. The castle in Golub-Dobrzyń was built in the beginning of the 14th century as a Teutonic defensive fortress. It was many times attacked, destroyed, rebuilt and finally converted in the Renaissance style as a palace of the princess Anna Vasa. Erected on a hill overlooking the town, the castle belongs to the most interesting edifices of Europe. The festive opening of the Chopin Centre at Szafarnia took place in 1952. It is held in historic Neo-Classical 19th century manor house. Frederic Chopin arrived to Szafarnia in 1824 and 1825. He spent there a school holidays with his colleague Dominik Dziewanowski. Here he learned the history and patriotism. He took part in the country wedding of the Lewandowskis and admired colorful harvest festival. In Szafarnia he composed the first four mazurkas. In this village Chopin issued a local newspaper "Kuryer Szafarski" ("Szafarnia Courier") along the lines of the "Warsaw Courier". Newspaper divided into domestic and foreign news, in a playful way informed his parents of the finest events that took place in Szafarnia. In accordance with the will of the mother, Frederick sent a letters almost daily from Szafarnia. One can see there tableaux, reproductions of Chopin's letters, his portraits and other mementoes of the great composer. An open-air museum in Wenecja (English: Venice) collects and exhibits steam locomotives, passenger and freight cars, trolleys, railwaymen's tools, signalling equipment, contents of an old waiting room, old maps. One of the oldest locomotive is the German one made by Orenstein & Koppel in Berlin in 1900. The Tx-1116 locomotive made by Henschel & Son (Kassel, 1918) and the Tx4-564 locomotive made by Hanomag (Hannover, 1923) are also very interesting. A real rarity is the Belgian locomotive made by Les Ateliers Metallurgiques Nivelles with the unique wheel arrangement 2-3-1 ("Pacific"), and the only one which has steam brakes. There are also steam locomotives made in the first Polish plant in Chrzanów. The exhibition is complemented by railway infrastructure: a historic waiting room, a level crossing attendant box with a gate, tracks with junctions, points, a sweep used for replenishing water in locomotives’ boilers, turn-table enabling changing direction. The museum is loceted on the trial of tourist rail from Żnin to Biskupin Arhcaeological Museum. Museum in Grudziądz was founded in 1884. Beginning of the collections was a few private object sets provided as a gift for a new public institution. From its early days it has become a many-themed museum. You could see the monuments of archaeology, history, ethnography, art, crafts and numismatics. • 'Norhern part of the Chełmno Land in the Middle Ages and in the Pehistory' - the exhibition presents the settlements, material, spiritual and social culture of people living in these areas till the 15th century. • 'Medieval Knights Settlement in Plemięta' - one of the most interesting and most spectacular archaeological discoveries of recent years comes from excavation research carried out on the medieval knights settlement in Plemięta (in the Chełmno Land, near Grudziądz), operating at the turn of the 14th century. Excellent state of preservation of the tower with a staircase leading to it and the elements of the pole-framework structure allowed do make a partial reconstruction. • 'Medieval Jewelry from Gruczno' - artefacts presented in the exhibition come from two cemeteries discovered in Gruczno near Grudziądz, dating back to the 11th-14th centuries. • 'Grudziądz within the years 1920-1939' - the city was then one of the most important centres of economy and politics in Pomerania Region, there operated large industrial plants. The city was a large military centre as well. • 'Gallery of Contemporary Pomeranian Art' - the exhibition presents works by artists associated with Pomerania since 1945, among whom proffessors of Toruń's university: Bronisław Jamontt, Tymon Niesiołowski, Stanisław Borysowki. • 'Cavalry Training Centre. The cradle of the Polish cavalry' - It shows the rich history of one of the largest training centres for cavallery in Europe. The only school in its kind was founded in 1920, acting out of necessity only to September 1939. • the Chełmno Gate: 'Snatched away from grounds' - the exhibition summarizes the results of research conducted by the archaeological museum in Brodnica for 25 years. We present here selected the most interesting archaeological sites and its artefacts. • Granary: 'Daily life of Mesolithic hunters of Mszano settlement 10,000 years ago' - the exhibition was reconstructed in 1:1 scale as a Mesolithic hunters camp. The construction uses only natural raw materials available to people then. The palace was built in the years 1795-1800 by Count Frederick Skórzewski within the area farm Piłatowo, which changed its name to the present in 1800 (the heart of 'beloved secluded spot' (Polish: 'lube ustronie')). The palace's designer was Stanisław Zawadzki - an outstanding architect of the era of Polish King Stanisław August Poniatowski, who based the project after the Italian famous designer of the 16th century, Andrea Palladio. Inside the decorations from the period 1800-1806. In the rotunda hall - the palace's central room - walls and pilasters with four large red stucco reliefs ("The Battle of Płowce", "Queen Hedwiga accepting the Teutonic Knights in the town of Inowrocław", "The Battle of Koronowo", "Approval of construction plans of Bydgoski Canal by Frederick the Great"). Living room floor is inlaid with Polish and Lithuanian coats of arms in the middle. The living room was decorated in the time of Polish partitions and bear witness to the patriotism of the owners. The idea to establish a museum in Bydgoszcz was implemented only when the city had been taken over by Polish authorities in 1920. The newly established Municipal Museum did not have abundant collections; these were first of all historical items from the fields of archaeology, history, numismatics and ethnography. After necessary adaptation works, the Municipal Museum named after Leon Wyczółkowski was officially opened on April 11, 1946. • 'Bydgoszcz memorabilia' - Presented are the various artefacts connected with Bydgoszcz's history, the life of its residents and the changes of architecture over centuries. • 'Bydgoszcz. City scraps' - the exhibition without the exhibition hall. All photographs have been placed on communication ways, accompanying visitors from the entrance to the museum. The other aspect is the nature of photography. So far it was the city of Bydgoszcz to be the hero of exhibitions and photo albums produced by the museum. This time is differently: the city became the backdrop for people and events. • 'Bydgoszcz masters of painting' - achievements of painters associated with the Bydgoszcz artistic circle. The museum was opened on 27 September 1980. Initially it was a branch of the District Museum in Bydgoszcz. In 1992 it was transferred under the management of the Tuchola Forest Landscape Park, and since 2001 the museum has been run by the County Office in Tuchola. The museum is housed in a 19th century building, the former granary. It's located at the former 14th and 15th century city walls and moats. • The Tuchola Forest Cottage - these are the two chambers of a reconstructed typical Tuchola Forest cottage.